First of all, block out the blizzard of food marketing around you. Thus it’s safe to say that, with few exceptions, any food that you see marketed should be avoided. 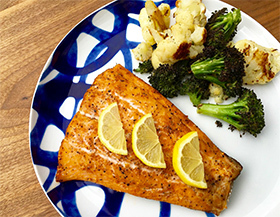 When was the last time you saw an ad for grilled white fish and steamed broccoli? 1. Scrambled egg whites, sliced tomato and steamed spinach. 2. Whole grain oatmeal, a scoop of protein powder and sliced fruit. 3. Homemade breakfast sandwich: Multi-grain English muffin with lean turkey slices and egg. 1. Dark baby greens topped with chopped chicken breast and diced tomatoes. 2. Albacore tuna (packed in water), mixed with finely chopped cucumber. 3. Lettuce Wrapped Sandwich: Lean turkey slices, lettuce, tomato and mustard. 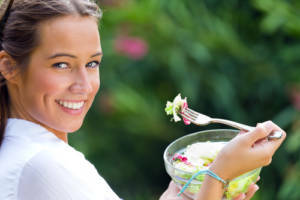 When you eat a simple, healthy diet you’ll never again be tempted to try the latest fad diet to drop a few pounds. So choose to eat lean proteins, seasonal vegetables and whole grains and avoid sugar, fried food and processed carbohydrates on a daily basis and enjoy living life at your ideal weight. This recipe for Cajun Salmon is a simple and flavorful way to eat a lean dinner. The Roasted Cauliflower and Broccoli are delicious enough to save the leftovers for a mid-afternoon snack! 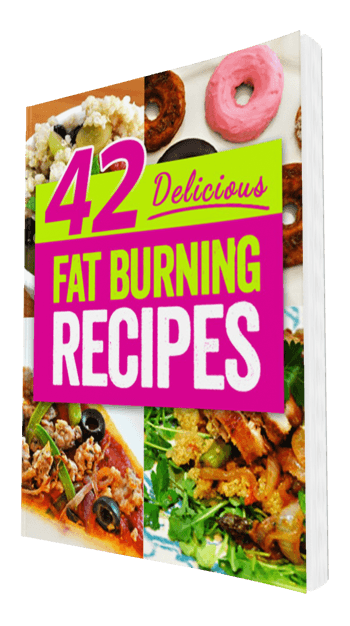 So start your healthy eating and cooking with these recipes. 1. Preheat the oven to 425 degrees F. On a rimmed baking sheet combine the cauliflower and broccoli florets with the olive oil, salt, black pepper and garlic. Roast for 20 minutes, until lightly charred then toss with lemon juice. 2. Reduce the oven temperature to 400 degrees F. Rub the salmon fillets with the Cajun seasoning then place on a baking sheet and roast for 15 minutes, until flaky. Serve with lemon slices. Enjoy!